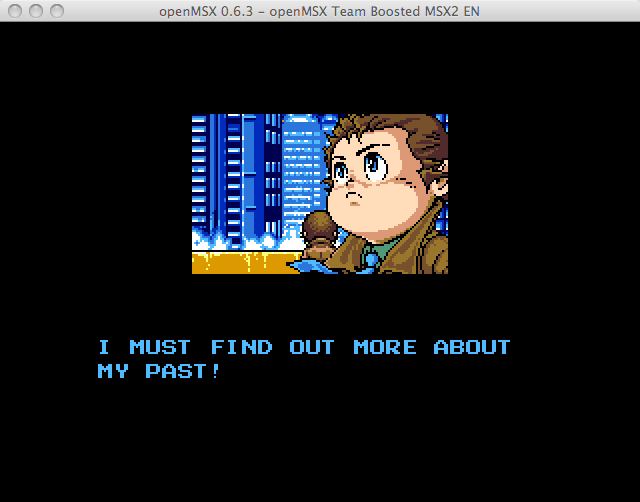 Completed SD Snatcher Thursday evening and I'm a bit mixed on the whole experience. On one hand, it was nice to see a reimaging of the Snatcher storyline with certain portions fleshed out or revised (including a completely new end sequence), but on the other hand it suffers from slow, combat intensive gameplay (including an encounter rate that'd make Skies of Arcadia blush) that can really bog it down. Not to say that the combat is bad, because it's not! Combat plays out like a mix of Dragon Warrior and Fallout, where you have the first person viewpoint, one or two enemies on the screen, and a grid overlaying the screen for you to position your reticule on. You can (and will) pick apart the enemies piece by piece as you knock out various aspects of them, such as shooting out the optical sensors (eyes, cameras, whatever) to lower/eliminate their accuracy, erode away at their defensive rating, blow their weapons up, etc. You'll find the optimal way to eliminate the enemy robots as you mow through the waves of them, and you've always got trusty Petit Metal Gear to auto attack in a fairly intelligent way for enemies that you've defeated in the past. The level of detail on the enemy sprites for this portion of the game is extremely impressive. Unfortunately, the combat moves fairly slowly as you fire shots, wait for shots to be returned, wait for the enemy to dodge, wait for your health to regenerate after popping pills, etc. The easy remedy is to have a key bound to toggle the emulator's speed throttle on/off. Flip off the throttle, zoom through combat, and flip it back on when you're done. Just ignore the hamster dance music from the increased playback speed (or turn your speakers down while grinding). 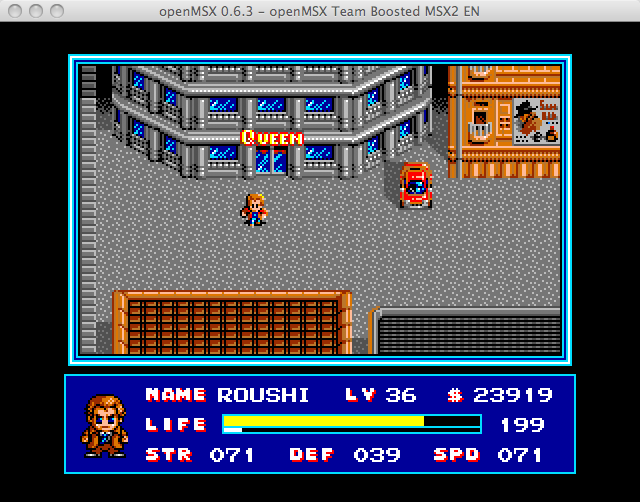 Walking about the city of Neo Kobe reveals one of the biggest shortcomings of a majority of MSX/MSX2 games that weren't single screen affairs: choppy scrolling. 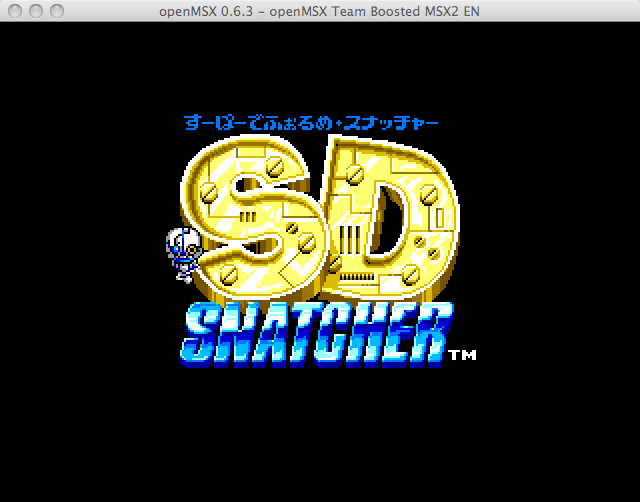 On some games it's not that bad at all, but with SD Snatcher it's pretty damn bad. You can ramp up the emulation speed to smooth it out a bit (at the expense of either faster music/sound), or you can just try to get used to it. The walking speed is incredibly slow when the whole screen has to redraw while it's fairly chipper when running through small hallways indoors. For what it's worth, I wound up unthrottling the emulation speed for all non-story segments. The story will both surprise and disappoint you if you're a fan of Snatcher. On the downside, characters like Napoleon, Katrina and Mika become smalltime bit players, the relationship with Jamie is never really built up throughout the game, there's next to no banter between Metal Gear and Gillian and some of the more memorable puzzles and revelations from Snatcher are completely omitted or spoiled (such as Search the House!, Face to Face and Oleen Hospital). Meanwhile, the scenarios have been largely revised; the ACT structure has been tossed out, chunks have been outright deleted (the hunt for and identity of Gibson's murderer, the exploding turbocycle, Plato's Cavern, Alice, etc), the city has been greatly expanded with more locations to roam around in, and as mentioned before, there's a whole new end game segment where the villain and heros' ultimate fates are scripted out in a completely new manner. 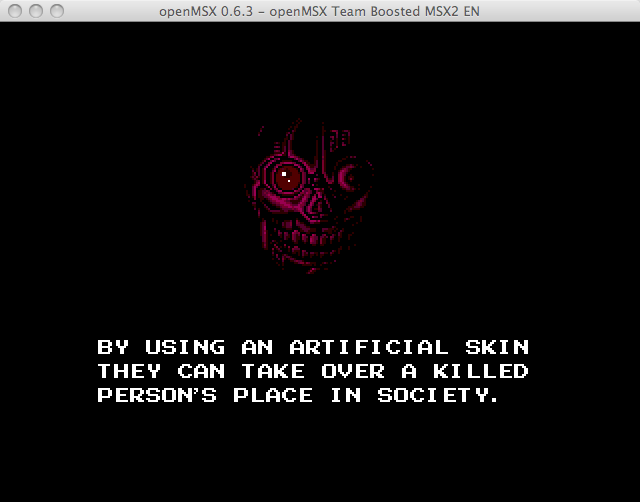 Also, keep your expectations low for the quality of the translation. 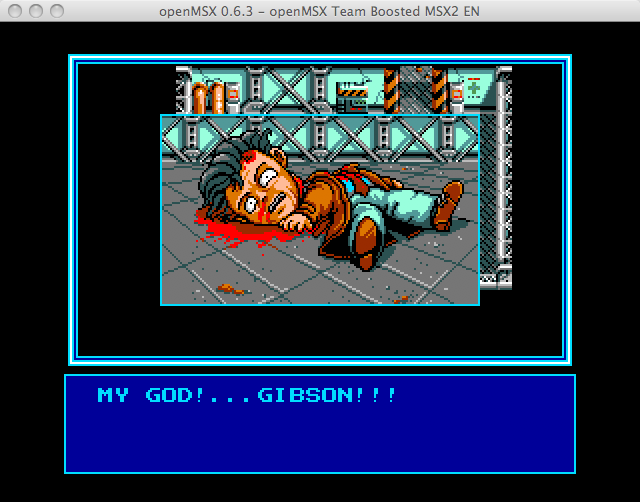 I love that Oasis churned out a number of J->E translations on the MSX, but standards in translations (both fan and professional) have greatly increased in the last 15 years. 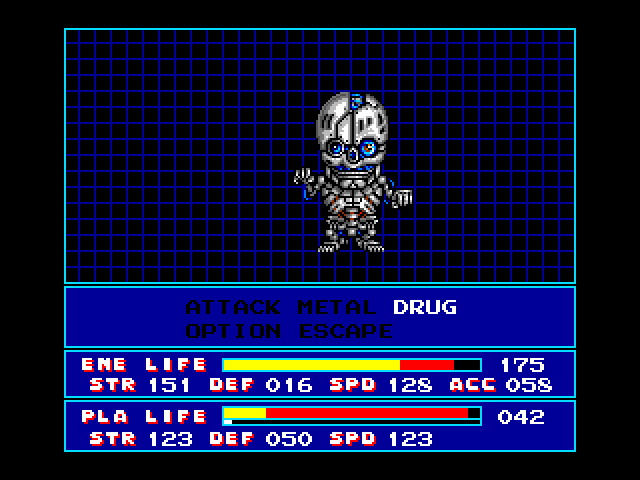 The game reads like a bad Konami NES translation, complete with: engrish, general grammar errors, spelling errors and a few wonky name translation choices. 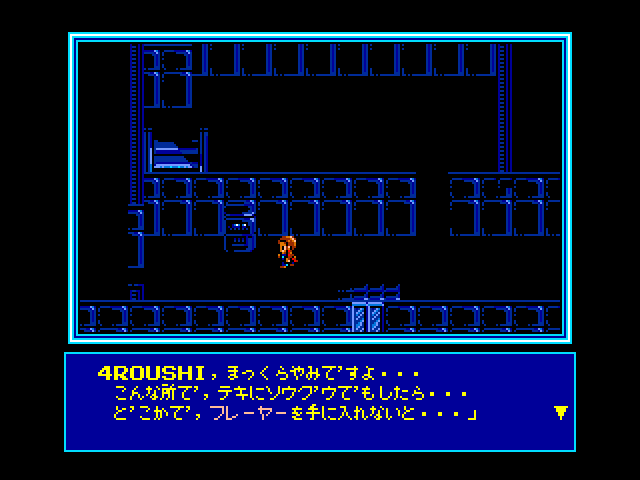 The game desperately needs a retranslation, but the likelihood of that ever happening is about as good as the MSX version of Snatcher having its script rewritten by a native english speaker (bonus points if they've got decent writing skills). Finally, swapping disks can be annoying, particularly when you die and have to pop in disc 1, pop in your save game disk, and then pop in whatever disk you were just on. From what I understand this isn't an issue if you've installed the game to a hard drive, but I haven't gotten around to getting it all set up to test with yet (it doesn't help that a majority of the documentation for doing so is written specifically for PC users), so perhaps once I get access to a wintel then I'll whip something up (Snatcher + Aleste 2+ SD Snatcher on a single hard drive with a boot menu to select which game to play? Oh my!). I can't say that I didn't have fun playing the game (once I ramped the speed up), but if I'd stuck to playing it on normal/default speed, I never would have made it out of the first quarter of the game. Your enjoyment of the game will depend on how forgiving you are of the speed (or how willing your are to use the equivalent to a fast forward key) and how much you like the combat system (which I personally thought was pretty damn neat). I think the game is about comparable to Ys II in length, but it's been a little bit since I played Ys II and I can't remember how aggressively I played it. Plus, I abused the fast forward key in that as well...seriously, it makes level grinding so much less painful in pretty much everything. Good info. Love that last pic. This page was loaded Apr 25th 2019, 10:09 am GMT.